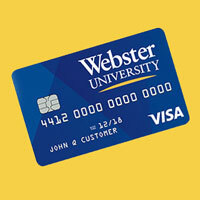 The Office of Advancement has created a new partnership with Commerce Bank in offering a Webster University Rewards Visa® Credit Card for alumni, students, faculty, staff and other supporters of the University. The card features a flexible rewards program with thousands of rewards options and additional cardholder benefits. Click here to access the Commerce website for more information, or to apply for the Webster University Rewards Visa® Credit Card.